This should be used after students complete the activities and lessons. It is designed to help you assess their understanding of the content. Students will work in small groups to determine answers to True/False, Choices & Consequences, and Fill-in-the-Blanks questions. The quiz will help you assess your students’ understanding of the content of the “Right Decisions, Right Now: Be Tobacco Free” program. When you are done with the lessons and your students have completed the activities, have your class break into small groups and face the interactive whiteboard. You may also opt to project this onto a screen from your computer. Display the main page of the quiz on the interactive whiteboard or projector screen. In this quiz, there are three categories: “True/False“, “Choices & Consequences“, and “Fill in the Blanks.” In each category, there are five questions. There is also one “Daily Double” question (worth twice the points) and a “Final” question. Decide which group of students will begin the game. Then, let them select a category and a number value. For example, they may select “True/False” for 200, or “Fill in the Blanks” for 400. They need not go in order. When students select a category and number value, click on it from your computer or at the interactive whiteboard to display the question. When you click a second time, the answer will be displayed. Do not display the answer until the correct answer has been given by a team or all groups have taken a turn. Review the answers first (in the “Answers” section) and consider printing them out for easy reference. To go back to the main quiz screen after each question is answered correctly, click on the back arrow at the bottom of the screen. Pose each question to the entire class and determine who will get to answer first based on speed of response. Alternately or in addition, you may wish to ask teams to write down their complete answers before raising their hand to respond. If you do so, you may opt to award points to all teams that get the correct answer, regardless of response time. In this case, have teams take turns selecting categories and point values, as well as answering. If you choose to determine who gets to answer first and earn points based on speed of response, follow these guidelines: if someone in a group raises their hand first, with the correct answer to the question in the category, they will then win the points and get to choose the next category and number value. If they raise their hand first but get the answer wrong, you would then allow the other teams to answer, based on how quickly they responded. The team with the correct answer, or the team that had the last correct answer, will choose the next category and point value. This will continue throughout the game. Request that a student volunteer keep track of points for each team on the chalkboard or on a piece of paper. When a team gets a correct answer, they earn the category value. When they get an incorrect answer, the point value of the question is deducted. Alternately, you may opt to only add and not deduct points. For the Final Question round, show the groups the category: “Health Consequences.” Based on the category, each group should write down a point value they are willing to risk. The scorekeeper should share the team scores prior to this point so groups can make an informed decision. Teams with the correct answer will have the point value they risked added to their score. Teams with an incorrect answer will have it deducted from their score, or simply not added. 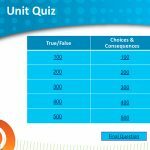 Emphasize that the point of the Unit Quiz is for students to have an opportunity to share what they’ve learned about being tobacco free. Note the questions students struggle with most and consider discussing them with students after the quiz. (100) Most middle schoolers are not current cigarette smokers. What is “True”? (200) Young people who smoke cannot become addicted to nicotine. What is “False”? (300) Many young people say they’re going to quit smoking in the future, and then can’t. What is “True”? (400) Smokeless tobacco is harmful to your health. What is “True”? (500) Smoking cannot cause heart disease. What is “False”? (100) Young people who smoke cigarettes_______. (200) Smoking cigarettes can damage________. (300) What best describes what you should think about when making a decision? (100) The chemical in tobacco that affects the brain is_______________. What is nicotine? They want to be tobacco free. They know about the health consequences. They are concerned about the non-health consequences (e.g., getting in trouble). Their friends don’t use tobacco. (300) “My friends who smoke teased me about trying it. So, after school I smoked a cigarette with them even though I didn’t want to.” This statement is an example of ______________. What is peer pressure? They don’t know how to say “no” to their friends. They don’t feel good about themselves (low self-esteem). They aren’t doing well in school. They don’t understand the health consequences. They think everyone is doing it (overestimating the number of people who smoke). They don’t realize they can become addicted (underestimating the addictive nature of nicotine). They think it will make them look cool or grown-up. They think it will help them fit in. Say “no” and suggest something else. Say “no” and talk about the consequences. Say “no” and reverse the pressure. Say “no” and change the subject. Say “no” and add some humor. Say “no” and walk away. Teachers, please note that students may come up with other types of cancer they believe are caused by smoking. Direct students to some of the online resources included in the program footnotes to have them check to see if they are correct. When the Unit Quiz is completed, congratulate students on what they’ve learned about being tobacco free! For your convenience, we have created this same activity in two formats. The optimized interactive whiteboard PowerPoint includes additional audio and visual effects to engage your students. Click here to download the PowerPoint. You’ll also find it in the “Materials” section below.